Nitrosomonas europaea is a widely studied chemolithoautotrophic ammonia oxidizing bacterium. While significant work exists on the ammonia oxidation pathway of N. europaea, its responses to factors such as dissolved oxygen limitation or sufficiency or exposure to high nitrite concentrations, particularly at the functional gene transcription level are relatively sparse. The principal goal of this study was to investigate responses at the whole-cell activity and gene transcript levels in N. europaea 19718 batch cultures, which were cultivated at different dissolved oxygen and nitrite concentrations. Transcription of genes coding for principal metabolic pathways including ammonia oxidation (amoA), hydroxylamine oxidation (hao), nitrite reduction (nirK) and nitric oxide reduction (norB) were quantitatively measured during batch growth, at a range of DO concentrations (0.5, 1.5 and 3.0 mg O2/L). Measurements were also conducted during growth at 1.5 mg O2/L in the presence of 280 mg-N/L of externally added nitrite. Several wide ranging responses to DO limitation and nitrite toxicity were observed in N. europaea batch cultures. In contrast to our initial hypothesis, exponential phase mRNA concentrations of both amoA and hao increased with decreasing DO concentrations, suggesting a mechanism to metabolize ammonia and hydroxylamine more effectively under DO limitation. Batch growth in the presence of 280 mg nitrite-N/L resulted in elevated exponential phase nirK and norB mRNA concentrations, potentially to promote utilization of nitrite as an electron acceptor and to detoxify nitrite. This response was in keeping with our initial hypothesis and congruent with similar responses in heterotrophic denitrifying bacteria. Stationary phase responses were distinct from exponential phase responses in most cases, suggesting a strong impact of ammonia availability and metabolism on responses to DO limitation and nitrite toxicity. In general, whole-cell responses to DO limitation or nitrite toxicity, such as sOUR or nitrite reduction to nitric oxide (NO) did not parallel the corresponding mRNA (nirK) profiles, suggesting differences between the gene transcription and enzyme translation or activity levels. The results of this study show that N. europaea possesses specific mechanisms to cope with growth under low DO concentrations and high nitrite concentrations. These mechanisms are additionally influenced by the physiological growth state of N. europaea cultures and are possibly geared to enable more efficient substrate utilization or nitrite detoxification. Nitrosomonas europaea is a widely studied chemolithoautotrophic ammonia oxidizing bacterium (AOB) that catalyzes the aerobic oxidation of ammonia (NH3) to nitrite (NO2-) using carbon dioxide (CO2) as the preferred assimilative carbon source . Bacteria closely related to N. europaea have been found in various natural and engineered environments indicating that they can proliferate under different growth conditions, by effectively utilizing growth substrates such as NH3 and oxygen [2–4]. 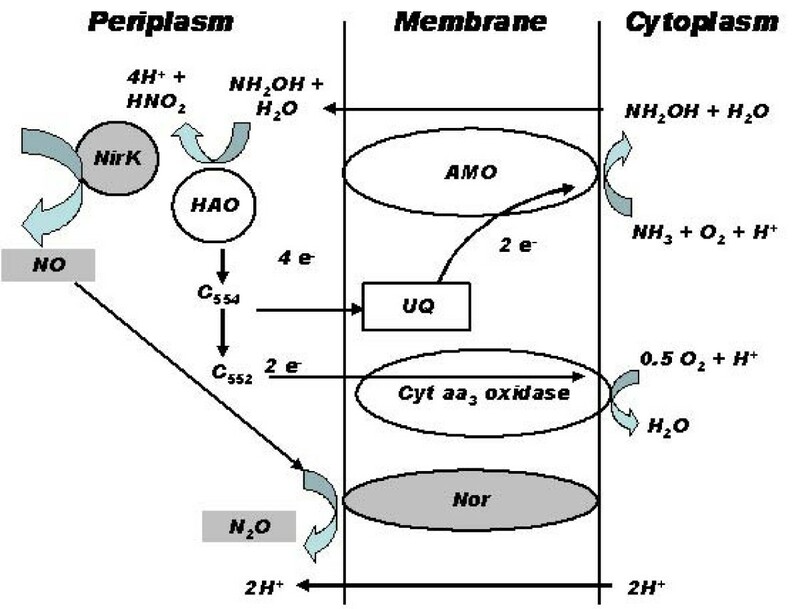 The oxidative catabolic pathway of N. europaea involves NH3 oxidation to hydroxylamine (NH2OH) by membrane bound ammonia monooxygenase (AMO) and NH2OH oxidation to NO2- by periplasmic hydroxylamine oxidoreductase (HAO) (Figure 1) . In addition, autotrophic denitrification by N. europaea has also been shown [6–8]. It is believed that denitrification by N. europaea is especially favored during growth under low dissolved oxygen (DO) concentrations or high nitrite concentrations  and results in the production of nitric oxide (NO) or nitrous oxide (N2O) [10, 11]. However, little information exists on the mechanisms driving the responses of N. europaea to DO limitation and possible NO2- toxicity . For instance, it is as yet unknown whether responses to DO limitation and NO2- toxicity at the whole-cell level are ultimate manifestations of changes in gene transcription and expression. Schematic of oxidative (unshaded enzymes) and reductive (gray shaded enzymes) nitrogen transformations in N. europaea (modified after ). In this study, the ability of N. europaea to transcribe four key genes involved in its catabolic pathway as a function of batch growth conditions (NH3 sufficiency and starvation, DO limitation and NO2- toxicity) was evaluated. It was hypothesized that DO limitation and NO2- toxicity would result in lower transcription of genes coding for NH3 and NH2OH oxidation (amoA and hao, respectively), given that these are the main steps leading to energy generation in N. europaea . Furthermore, given that low DO and high NO2- concentrations are two main triggers for expression of denitrification genes in heterotrophic bacteria , it was hypothesized that decreasing DO concentrations and high NO2- concentrations would similarly induce progressively higher transcription of NO2- and NO reductase genes in N. europaea (nirK and norB, respectively). The specific objectives of this study were to (i) quantitatively measure the transcription of amoA, hao, nirK and norB, four genes involved in redox N transformations, in N. europaea during batch growth at different DO and initial NO2- concentrations; and (ii) compare gene transcription level responses to DO limitation and NO2- inhibition with 'whole-cell' responses related to activity, biokinetics and production of gaseous NO- the first product of sequential NO2- reduction by N. europaea. Batch cultivation of N. europaea cultures at different DO concentrations (0.5, 1.5 and 3.0 mg O2/L) led to several differences at the nitrogen speciation, biokinetics and gene transcription levels. Based on a studentized t-test, the degree of NH3-N conversion to NO2--N at DO = 0.5 mg O2/L (76 ± 16%) was significantly lower (p < 0.05) than at DO = 1.5 mg O2/L, (90 ± 10%) or DO = 3.0 mg O2/L (89 ± 15%), respectively, (Figure 2, A1-C1). The final cell concentrations were relatively uniform for all three DO concentrations (Figure 2, A2-C2). However, the lag phase at DO = 0.5 mg O2/L was one day longer than at DO = 1.5 or 3.0 mg O2/L pointing to the impact of electron acceptor limitation on the cell synthesizing machinery of N. europaea (Figure 2, A2-C2). Estimates of the maximum specific growth rate (obtained via non-linear estimation ) at DO = 0.5 mg O2/L (0.043 ± 0.005 h-1), 1.5 mg O2/L (0.057 ± 0.012 h-1) and 3.0 mg O2/L (0.060 ± 0.011 h-1) were not statistically different at α = 0.05. At all three DO concentrations tested, low levels of NH2OH transiently accumulated in the growth medium during the exponential phase, in keeping with its role as an obligate intermediate of NH3 oxidation  (Figure 2, A1-C1). The initial increase in NH2OH concentrations at DO = 0.5 mg O2/L, was the slowest, due to the longer lag-phase (Figure 2, A1). The peak NH2OH concentration at DO = 0.5 mg O2/L was also lower than at DO = 1.5 or 3.0 mg O2/L (Figure 2, A1-C1). NH 3 -N, NO 2 - -N, and NH 2 OH-N, (A1-C1), cell density and sOUR (A2-C2) profiles during N. europaea batch growth at DO = 0.5 mg/L (A), 1.5 mg/L (B) and 3 mg/L (C). The peak 'potential' biokinetics of NH3 oxidation (expressed as sOUR, and measured under non-limiting DO and ammonia concentrations) varied inversely with reactor DO concentrations (Figure 2, A2-C2). sOUR values consistently peaked during early exponential growth phase followed by a significant decrease during stationary phase (Figure 2, A2-C2), in good correspondence with recent results . Additional sOUR assays could not be conducted during the lag phase, owing to low cell concentrations, which would have consequently necessitated removal of excessively high sampling volumes. Headspace NO concentrations peaked during the exponential phase and significantly diminished upon NH3 exhaustion in the stationary phase (Figure 3, A3-C3). An increasing trend in peak headspace NO concentrations was observed with increasing DO concentrations. NO formation was strictly biological and was not observed in cell-free controls (data not shown). At all DO concentrations tested, intracellular NO was detected in the majority of sampled cells (Figure 3 A3-C3). NO 'positive' cell concentrations were highest especially during late exponential and stationary phases when NO2-, the likely substrate for NO production, concentrations were the highest (Figure 3 A3-C3). The more gradual increase in the proportion of NO positive cells at DO = 0.5 mgO2/L paralleled the trend in peak headspace NO concentrations (Figures 2, 3). NO profiles and fraction of NO containing cells (A3-C3), and gene expression (A4-C4) during exponential phase and stationary phase at DO = 0.5 mg/L (A), 1.5 mg/L (B) and 3 mg/L (C) for cultures shown in Figure 2. The impact of operating DO concentrations on gene transcript profiles, determined using primer sets described in Table 1, was dependent upon the physiological growth phase. In exponential phase cell samples, amoA and hao relative mRNA concentrations statistically decreased with increasing reactor DO concentrations (Figure 3, A4-C4, Table 2). A systematic impact of growth phase on nirK and norB relative mRNA concentrations was not observed during exponential phase. The relative mRNA concentrations for both genes during exponential phase were statistically similar for DO = 0.5 and 1.5 mg O2/L and statistically higher (for nirK) or lower (for norB) at DO = 3.0 mg O2/L (Figure 3, A4-C4, Table 2). In direct contrast, during stationary phase, the relative mRNA concentrations of amoA, hao and nirK all statistically increased with increasing DO concentrations. Additionally, the relative mRNA concentrations of norB at DO = 1.5 mg O2/L were statistically higher than at DO = 0.5 mg O2/L, but statistically similar to those at DO = 3.0 mg O2/L (Table 2). Statistical comparison of the impact of DO concentrations on relative mRNA concentrations in exponential (E) and stationary (S) phase cultures (p values < 5.0 × 10-2 indicate statistically significant differences). Underlined text indicates statistically similar results, bold text indicates statistical increase and regular text indicates decrease. At DO = 0.5 mg O2/L, the transition from exponential phase to stationary phase resulted in a systematic decrease in relative mRNA concentrations of all four genes (Figure 3A4-C4 and Table 3). At DO = 1.5 mg O2/L, this trend was valid for amoA, hao and norB. However, the stationary phase nirK relative mRNA concentrations were statistically higher than during exponential phase. At DO = 3.0 mg O2/L, only hao and norB displayed a decrease in relative mRNA concentrations upon transition from exponential to stationary phase (Figure 3A4-C4, Table 3). In contrast, relative mRNA concentrations of amoA and nirK increased during stationary phase (Figure 3A4-C4, Table 3). Additionally, except at DO = 1.5 mg O2/L for nirK, the relative retention of amoA mRNA concentrations during stationary phase relative to exponential phase was consistently the highest (Figure 3 B4-C4). The retention factors averaged across all three DO concentrations were 1.98:1, 0.21:1, 1.86:1 and 0.08:1 for amoA, hao, nirK and norB, respectively (where a retention factor > 1) suggests relative increase during stationary phase). Statistical comparison of relative mRNA concentrations and sOUR in exponential and stationary phase cultures grown at different DO concentrations (p values < 5.0 × 10-2 indicate statistically significant differences). Cell growth was not detected at an initial NO2- concentration of 560 mg-N/L and DO = 1.5 mg O2/L, even after 2 weeks of incubation (data not shown). An initial NO2- concentration of 280 mg NO2--N/L and DO = 1.5 mg O2/L, resulted in a lag phase one day longer than that in the initial absence of nitrite (Figure 4 D1-D2 and Figure 2, B1-B2, respectively). However, the overall cell yield was not impacted. The extent of NH3 oxidized to NO2- in the presence of 280 mg NO2--N/L (88 ± 5%, n = 2) was not significantly different (α = 0.05) than in the absence of nitrite (90 ± 10%, n = 2). 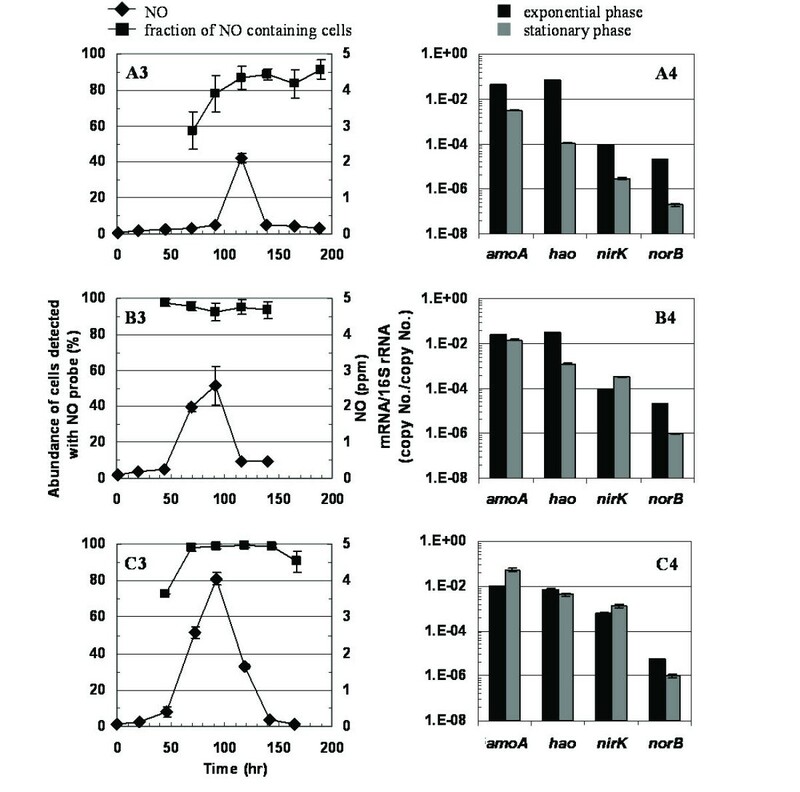 NH2OH accumulation was observed during the extended lag phase suggesting initial inhibition of NH2OH oxidation by NO2- (Figure 4, D1). Lower NO production was observed in the presence of added NO2- (Figure 4, D3). In parallel, a substantial reduction in the fraction of cells with detectable intracellular NO was also observed, from 98.3 ± 2.1% during exponential phase to 66.6 ± 10.4% during stationary phase (Figure 4, D3). sOUR values were not significantly different (α = 0.05) in the presence or absence of added NO2--N/L (Figure 4, D2, Figure 2, B2, respectively). Exponential phase relative mRNA concentrations of amoA and hao were statistically lower during growth in the presence of 280 mg NO2--N/L than in the absence of added nitrite (Figure 4, D4, Table 4). However, exponential phase transcription of nirK and norB was significantly higher in the presence of 280 mg NO2--N/L than in the absence of added nitrite (Figure 4, D4 and Figure 3, B4, Table 4). During stationary phase, amoA, hao, nirK and norB relative mRNA concentrations were all statistically lower in the presence of 280 mg NO2--N/L than in the absence of added nitrite (Figure 3, B4 and Figure 4, D4, Table 4). 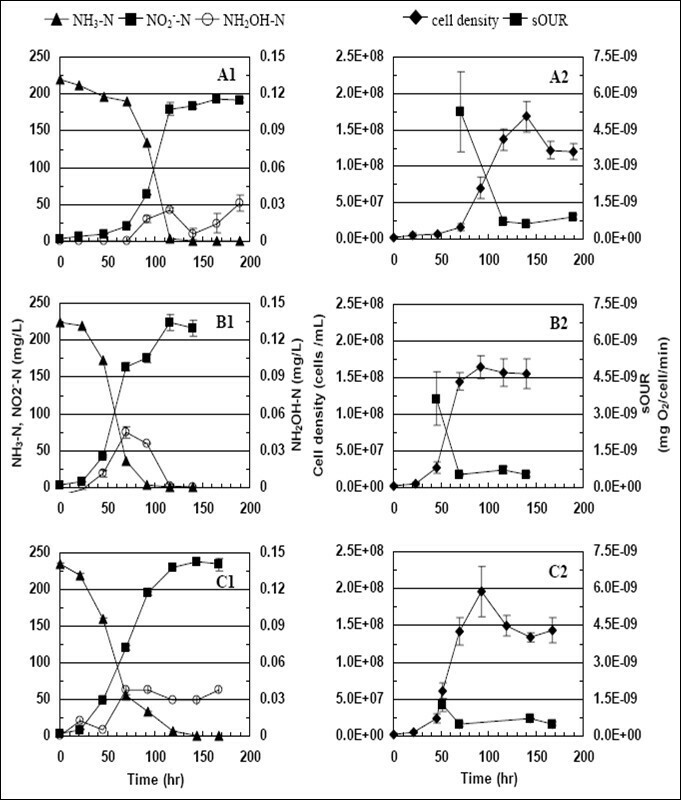 Profiles of NH 3 -N, NO 2 - -N, and NH 2 OH-N (D1), cell density and sOUR (D2), NO and fraction of NO containing cells (D3) and gene expression (D4) during exponential phase and stationary phase at DO = 1.5 mg/L in the presence of added 280 mg NO 2 - -N/L. Statistical comparison of relative mRNA concentrations and sOUR in exponential (E) and stationary (S) phase cultures grown in the presence and absence of nitrite (p values < 5.0 × 10-2 indicate statistically significant differences). In addition to its well-studied NH3 oxidation pathway, the genome of N. europaea contains genes coding for several denitrification steps, including NO2- and NO reduction . While significant work exists on expression analysis of amoA and to an extent, hao, [17–22], quantitative transcription patterns for nirK and norB are relatively less characterized. The significance of this study therefore lies in elucidating the co-transcription patterns of amoA, hao, nirK and norB under varying degree of DO and NO2- exposure during batch growth of N. europaea. The general overall reduction in amoA transcription during the stationary phase, at DO = 0.5 and 1,5 mg O2/L (Figure 3, A4-B4), can be linked to dwindling energy resources for N. europaea [15, 23] or toxicity of accumulating NO2- concentrations . The higher amoA relative mRNA concentrations during the stationary phase at DO = 3.0 mg O2/L were not expected and likely due to the opposing trends in exponential phase and stationary phase responses to increasing DO concentrations (Figure 3, B4-D4), as discussed below. The retention of relatively higher amoA mRNA concentrations during stationary phase compared to those for hao, nirK and norB points to the capability of N. europaea to sustain and rapidly increase NH3 oxidation during a transition from a starvation state (as in stationary phase) to when NH3 becomes available. Since NH3 oxidation is the very first step in energy generation for N. europaea, it is indeed advantageous to retain the capability (by retaining amoA mRNA) for this step to a certain extent compared to downstream steps. These results are consistent with the higher retention of amoA mRNA concentrations relative to those for other genes coding for carbon dioxide fixation for growth, ion transport, electron transfer and DNA replication . In fact, an actual increase in NH3 transport genes during NH3 starvation in stationary phase has also been observed . The increasing trend in relative mRNA concentrations of amoA and hao and sOUR with decreasing DO concentrations during exponential growth reflect a possible strategy of N. europaea to (partially) make up for low DO concentrations by enhancing the ammonia and hydroxylamine oxidizing machinery. One possible means to enhance substrate utilization rates at reduced DO concentrations could be to increase the capacity for oxygen transfer into the cell itself. An alternate means could be by enhancing the ammonia or hydroxylamine oxidizing machinery (mRNA, proteins and or protein activity). The volumetric ammonia oxidation rate depends upon the mathematical product of AMO (or HAO) protein concentrations, their activity and DO concentrations (as given by the multiplicative Monod model ). Therefore, potentially similar ammonia oxidation rates could be maintained at lower DO concentrations by increasing the catalytic protein concentrations (or those of their precursors, such as mRNA) or activities (as measured by sOUR assays). Such an enhancement might be manifested in higher 'potential' oxygen uptake rates, measured under non-limiting DO concentrations. 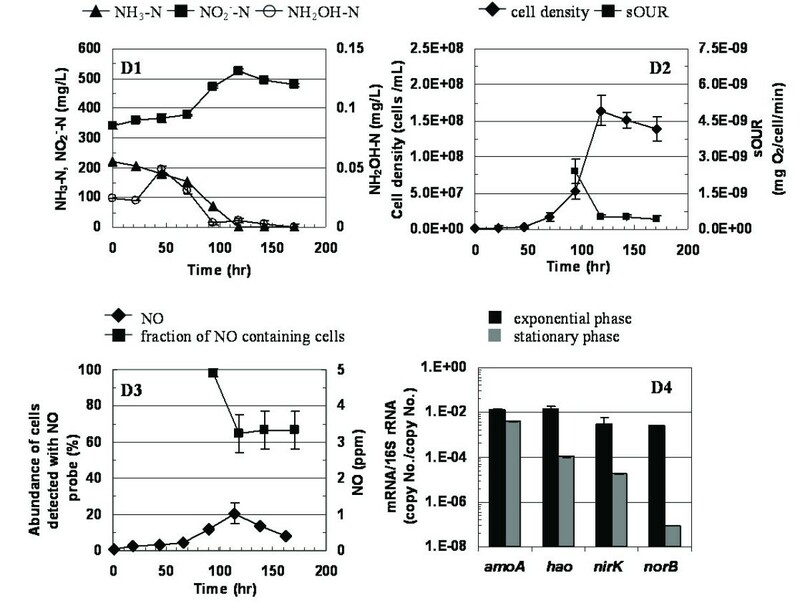 Notwithstanding increased 'potential' NH3 or NH2OH oxidation activity from cells exposed to sustained lower DO concentrations, actual 'extant' activity is indeed expected to be lower under stoichiometric DO limitation, resulting in lower rates of batch cell growth or nitrite accumulation (Figure 2, A2-C2). Based on a recent study, N. europaea cultures demonstrated similar increases in amoA transcription and sOUR when subject to NH3 limitation in chemostats, relative to substrate sufficient batch cultures . While it is documented that NirK is involved in NH3 oxidation by facilitating intermediate electron transport , the specific role of the Nor cluster in NH3 metabolism and exclusivity in N2O prodution is unclear . Both NirK and Nor act upon products of upstream AMO and HAO. Thus, the lack of systematic trends in relative mRNA concentrations of nirK or norB with changing DO concentrations possibly point to less stringent regulation of these two genes during exponential growth in the overall catabolic pathways of N. europaea. In contrast to exponential phase, the statistical increase in relative mRNA concentrations with increasing DO concentrations for all four genes during stationary phase is clearly intriguing. These trends highlight the impact of starvation on responses to different DO concentrations. Although the unique responses of N. europaea to starvation  and oxygen concentrations (via Fnr ) have been documented, the mechanisms of combined NH3 and DO based gene regulation in N. europaea are not well understood. It is well documented that ammonia oxidizing bacteria, such as N. europaea, are commonly subject to cycling between anoxic and oxic conditions and a wide range of NH3 concentrations in engineered and natural environments such as wastewater treatment plants or soils [24, 27, 28]. The specific responses observed herein might be part of a coordinated strategy of N. europaea to maintain active or latent substrate metabolic machinery to counter such varying environments and clearly merit further study. The differences in observed transient accumulation of NH2OH could also be explained at the transcription and protein activity levels. The decrease in exponential phase hao relative mRNA concentrations with increasing DO was more rapid than for amoA (Figure 3 A4-C4). This decrease coupled with a decrease in sOUR (a composite measure of AMO and HAO activity) with increasing DO, could have resulted in the observed trends in NH2OH concentrations. Although it has been shown that N. europaea can retain high levels of HAO protein and activity under ammonia starvation , the impact of DO concentrations on HAO activity has not been specifically identified. While the gene transcript data provide good insights into possible responses of N. europaea to different DO concentrations, protein activity data is crucial to explain profiles of intermediates such as NH2OH. The parallel profiles of exponential phase nirK relative mRNA concentrations and headspace NO concentrations at different DO concentrations (Figure 3) suggest a possible link between nirK transcription and NO generation. However, the loss of this parallel in the presence of added NO2- (higher nirK gene transcription but lower NO concentrations, Figure 4) suggests the possible presence of NO generation pathways that are distinct from NO2- reduction, as pointed out previously  or even post-transcriptional effects. Indeed, there is still no consensus about the source of NO produced by AOB, such as N. europaea, and the potential roles of nirK, hao and a multicopper oxidase of the nirK operon have all been implicated . High NO2- concentrations have been implicated as the principal trigger for high NirK protein activity in N. europaea , which has a fundamental grounding in the similar trends observed in this study at the nirK gene mRNA level during exponential growth (Figure 4 D4). Increased nirK transcription is the result of the regulatory activity of the NsrR repressor protein, which is present in the genome of N. europaea . NsrR is responsible for sensing NO and NO2- concentrations and is supposedly involved in the transcriptional regulation of several operons including the nirK gene cluster of N. europaea . Although N. europaea contains norB, alternate pathways are possibly involved in the production of N2O , the increased transcription of norB, shown in this study cannot be unequivocally reconciled with functional N2O production. Nevertheless, the increased transcription of both nirK and norB in response to high nitrite concentrations is in keeping with one of our initial hypotheses. The uniformly lower transcript concentrations upon growth with added 280 mg NO2--N/L could be a result of energy resources channeled towards mitigation of nitrite toxicity rather than its utilization as an electron acceptor during stationary phase. In general, it could be argued that in response to nitrite toxicity during ammonia starvation, there is little incentive to increase transcription of putative nitrite and nitric oxide reduction pathways. However, it should be noted that the lower transcript abundance during stationary phase when grown with added 280 mg NO2--N/L is in direct contrast to an increase in nirK during stationary phase, when grown without added NO2--N (Figure 3 B4-C4). The more gradual build-up of nitrite in the latter case could have allowed for adaptation, whereas the initial spike of 280 mg NO2--N/L might have imposed a significant toxic stress that resulted in reduced growth and different transcriptional profiles. Indeed, the toxic stress was possibly too severe at 560 mg NO2--N/L, which resulted in no growth whatsoever. Additionally, the reduction in transcript abundance of amoA and hao in the presence of NO2--N, did not parallel the relatively unchanged sOUR in the presence or absence of NO2--N. Given that sOUR is a measure of the sum of AMO and HAO activities, these results also suggest uncoupling of the responses at the gene transcription and post-transcriptional or translational levels (Figure 4). Responses at the protein abundance and activity levels would be needed to substantiate and provide an explanation for such uncoupling. It should be noted that the severe impacts of added nitrite were possibly related to the application of these high nitrite concentrations at the beginning of the batch growth assays. Had the nitrite concentrations been applied during periods of relatively higher cell concentrations (during exponential or stationary phase), the impacts might have been less severe, given that the cells were already producing and responding to the increasing NO2--N levels in the culture medium. Thus, in a sense, the results reported herein represent the most extreme response of N. europaea cultures to nitrite exposure. The responses of N. europaea to cope with DO limitation and NO2- toxicity were wide-ranging from the gene transcription through whole cell levels. The results refuted the initial hypothesis that low DO is one of the main pre-requisite conditions for the transcription of nirK and norB genes in N. europaea. On the other hand, these results indeed supported our other hypothesis that higher NO2- concentrations constitute the principal trigger for increased relative transcription related to autotrophic denitrification reactions. The distinct responses observed during the exponential and stationary phase to both DO limitation and nitrite toxicity highlight the need to understand the specific regulatory mechanisms employed by N. europaea to jointly counter substrate starvation and stress. N. europaea (ATCC 19718, Manassas, VA) batch cultures were cultivated in the dark in batch bioreactors (Bellco Glass, Vineland, NJ, working volume = 4 L, agitation speed = 200 rpm) in a growth medium containing 280 mg-N/L and in addition (per liter): 0.2 g of MgSO47H2O, 0.02 g of CaCl22H2O, 0.087 g of K2HPO4, 2.52 g EPPS (3- [4-(2-Hydroxyethyl)-1-piperazine] propanesulfonic acid), 1 mL of 13% EDTA-Fe3+, 1 mL of trace elements solution (10 mg of Na2MoO42H2O, 172 mg of MnCl24H2O, 10 mg of ZnSO47H2O, 0.4 mg of CoCl26H2O, and 100 mL of distilled water), 0.5 mL of 0.5% phenol red, and 0.5 mL of 2 mM CuSO45H2O. Reactor pH was controlled in the range 6.8-7.4 by manual addition of pre-sterilized 40% potassium bicarbonate solution. Batch growth experiments were conducted at three DO concentrations, 0.5 ± 0.05, 1.5 ± 0.05 and 3.0 ± 0.05 mg O2/L. Batch reactor DO was measured and controlled with a fermentation DO probe and benchtop dissolved oxygen meter and controller system (Cole-Parmer, Vernon Hills, IL) using a combination of filter sterilized (0.2 μm pore size, Millipore®, Ann Arbor, MI) nitrogen gas or air. In select experiments conducted at DO = 1.5 ± 0.05 mg O2/L, the feed medium additionally contained 280, or 560 mg NO2--N/L before N. europaea inoculation, which enabled the determination of batch growth in the presence of these high NO2--N concentrations. NH3 (gas-sensing electrode, Corning, Corning, NY), NH2OH , NO2- (diazotization, , cell concentration (direct counting) and gaseous NO (chemiluminescence, CLD-64, Ecophysics, Ann Arbor, MI) were measured once a day during the batch growth profile. All batch growth experiments were conducted in duplicate. Intracellular NO presence was determined by staining with 4-amino-5-methylamino-2',7'-difluorofluorescein diacetate (Molecular Probes, Eugene, OR) for 30 min in the absence of light. Stained cells were washed twice with sterile NH3-free medium and quantified immediately with epifluorescence microscopy (Nikon ECLIPSE 80 i) using a minimum of 10 randomly-chosen microscopic fields (each 0.30 × 0.22 mm2). NO was specifically the focus of gaseous bulk phase and intra-cellular measurements since it is the direct product of nitrite reduction, the main focus of this study. Additionally, the presence of NO inside N. europaea cells strongly implicates its direct production by the cells themselves rather than by extracellular abiotic reactions. In contrast to NO, there is currently no method that allows detection of intracellular N2O. Therefore, N2O data was not included in bulk or intracellular measurements. The 'potential' maximum biokinetic rates of NH3 oxidation were determined using a short-term (lasting approximately 30 min) batch respirometric assay . The term 'potential' describes non-limiting NH3 (initial concentration of 50 mg-N/L) and oxygen concentrations (supersaturated initial concentration of approximately 40 mg O2/L, shown previously to be non-inhibitory to NH3 oxidation ). Maximum NH3 oxidation activity per cell was expressed as the specific oxygen uptake rate, sOUR and was calculated by dividing the slope of the respirograms (DO vs time) by the cell concentration. 40 ml cell suspensions were collected and immediately centrifuged at 4°C and 5000*g for 10 min. The resulting cell-pellets were resuspended and lysed in 1 mL TRIzol® solution (Invitrogen, Carlsbad, CA). RNA was isolated from lysed cell pellets using the TRIzol® RNA isolation protocol (Invitrogen). Subsequent DNA removal and reverse transcription was performed using the QuantiTect® Reverse Transcriptase kit (Qiagen, Valencia, CA). Transcript abundance of amoA, hao, nirK and norB was quantified by real-time reverse-transcriptase polymerase chain reaction (q-RT-PCR) using previously documented and newly designed primer sets (Table 1). Additional primers for conventional end-point PCR were also designed for hao, nir K and nor B and used for preparing standard curves for q-RT-PCR (Table 1). Transcription of functional genes was normalized to 16S rRNA concentrations quantified using primers EUBF and EUBR . q-RT-PCR and endpoint PCR were performed in duplicate on an iCycler iQ™5 (Bio-Rad Laboratories, Hercules, CA). A no-template-control was included for each set of PCR and q-RT-PCR reactions. Standard curves for q-RT-PCR consisted of six decimal dilutions of the respective plasmid DNA (corresponding to the four functional genes), containing a given endpoint PCR product. Plasmid concentrations were quantified (Cary 50 UV-Vis spectrophotometer, Varian, Palo Alto, CA) and translated to copy number assuming 660 Da per base pair of double-stranded DNA . Transcript abundance was determined from samples obtained during exponential phase. For exponential phase cultures, sampling time points were 70 hr, 45 hr, and 52 hr for DO concentrations of 0.5, 1.5 and 3 mg/L, respectively, and corresponded to similar cell densities (Figure 3, A4-C4)). For stationary phase cultures, the sampling time points were 165 hr, 116 hr, and 119 hr for DO concentrations of 0.5, 1.5 and 3 mg/L, respectively (Figure 3, A4-C4)). The sampling time points for exponential and stationary phase cultures, which were grown with addded 280 mg NO2--N/L were 95 hr, and 143 hr, respectively (Figure 4, D4). This study was co-supported by the National Fish and Wildlife Foundation and the Water Environment Research Foundation. RY performed the experiments and drafted the manuscript. KC conceived of and developed the study, helped to analyze and interpret the results and draft the manuscript. Both authors have read and approved the final manuscript.